It’s the simple homemade foods in life that give me the most joy. A cup of steaming hot coffee topped off by an easy froth of warmed half and half (using this tool) and a generous shake of raw sugar, a robust sun-dried tomato spread to slather across a wrap for lunch, a perfectly charred and caramelized sugared ribeye pulled off the grill. Yes, this is the very best stuff. Quick and easy, full of flavor, and made with my own two hands. 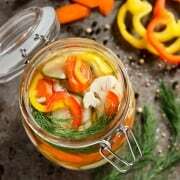 Now here’s another easy recipe I’m so happy to share with you, my latest pickling obsession. The recipe is highly adaptable. Use whatever veggies you fancy (my favorite combo is English cucumbers, cauliflower, carrots, and a variety of sweet bell peppers), just promise me you’ll make a batch. These Pickled Vegetables are crunchy and tangy and completely irresistible! Also be sure to check out a few more of my pickled favorites: There is always a jar of pickled red onions in our fridge. Always! And all the gratitude to my mom for introducing me to her refrigerator sweet pickles and her sweet onion coleslaw dressing. Love. Love. Love! Across the street from the office is a gem of a cafe, if you’re ever in my neighborhood. Brimming with all kinds of deliciousness and proud of its local sourcing, the Chilkoot Cafe and Cyclery is one of my favorite spots to grab coffee or lunch with a friend from work. The menu is hand drawn by Bear Fox Chalk, an amazing work of art that always mesmerizes me and leaves me pondering the switching of careers. 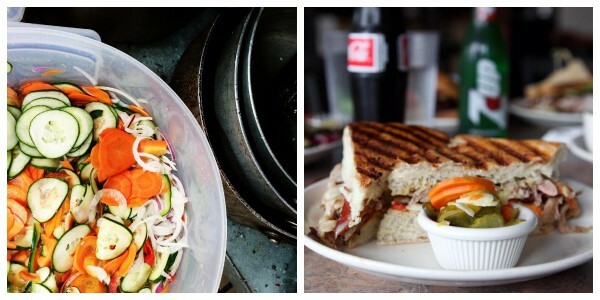 The Chilkoot lunch menu is never short on flavor or variety, loaded with all kinds of fresh salads, sandwiches, and wonderful soups. But my favorite dish, the one that I always ask for a double helping of, is their side of pickled vegetables. 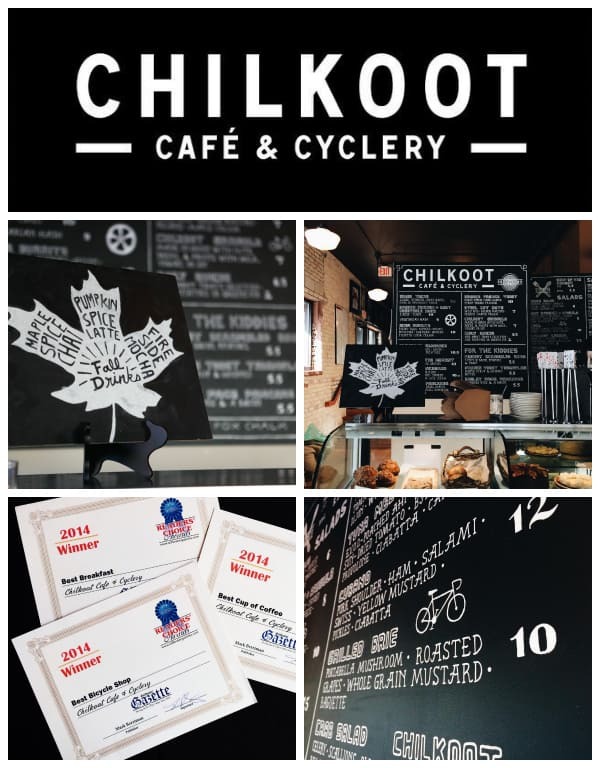 Coffee at Chilkoot Cafe and Cyclery is always fresh and hot and beautiful, using beans roasted in house. 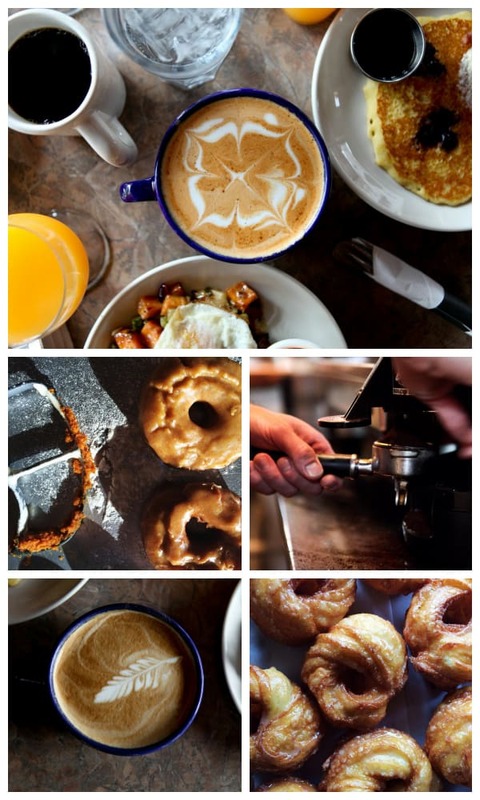 Order a hot breakfast plate and one of their beautiful pastry items, and your day will be off to an awesome start. 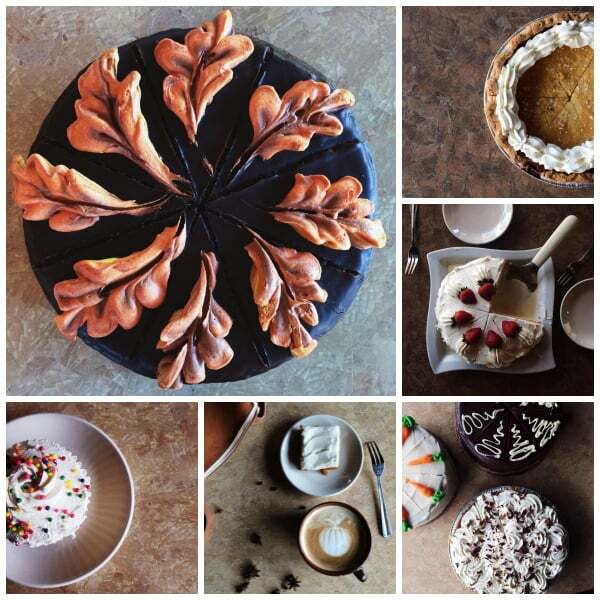 All their desserts are made in house. The glass dessert case, a major temptation while standing at the menu board, is in constant rotation of beautiful and seasonal creations. This cafe is definitely unique. 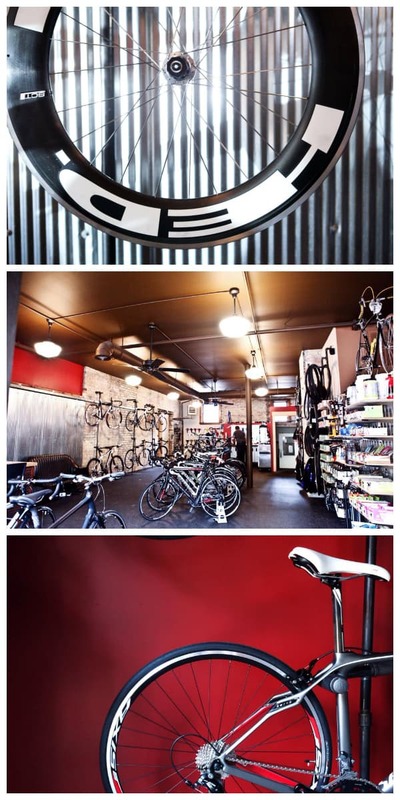 Walk to the back, or enter through the side door, to find yourself in a full service bike shop. Proud to offer incredible attention to detail, the cyclery personally fits individuals to just the perfect bike. They also offer a full line of accessories, plus bike repair and service, and are super active in the local biking community. 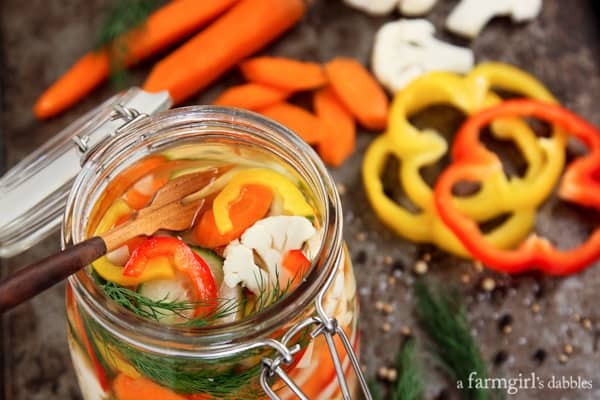 6 c. thinly sliced vegetables of your choice – use any combination of carrots, golden beets, sweet bell peppers, celery, cucumbers, cauliflower, etc. In a large heat-safe bowl, combine onion, garlic, and your choice of vegetables. Then top with the dill. Place mustard seeds and peppercorns in a small ziplock bag, cover the bag with a towel, and use a kitchen mallet or rolling pin to crack the mustard seeds and peppercorns up a bit. Then pour them into a coffee filter, add the bay leaf, and tie the filter securely with kitchen string. Add the spices to a medium sized pan along with the vinegars, water, sugar, and salt. Bring to a boil and stir until sugar dissolves. Pour boiling mixture, along with the spices, evenly over vegetables. Let come to room temperature, give everything a stir, and then cover and refrigerate. 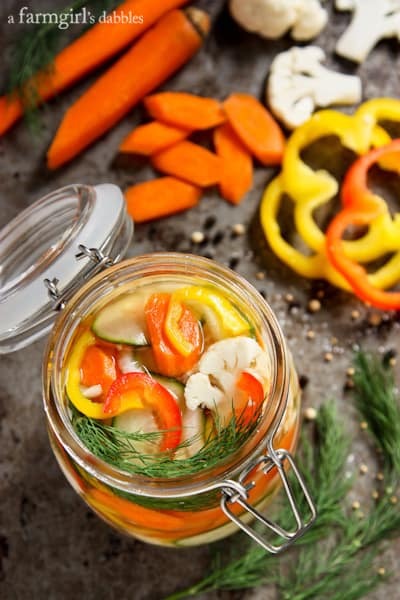 After 24 hours, discard the spices and transfer pickled vegetables to a large jar or a few smaller jars if desired. Keeps very well for up to a month stored in the refrigerator. Original recipe from Chilkoot Cafe and Cyclery. Printed with permission and adapted slightly for a smaller quantity.